The federal government remains in a partial shutdown, the longest in US history, as President Trump and Democrats in Congress are deadlocked over funding for expanding the border wall with Mexico. A just-completed Chicago Council Survey shows that both sides have the backing of their public constituencies, but the President’s insistence on this topic has not boosted support for the expansion among the general public. Overall more Americans now oppose expanding the US-Mexico border wall since last asked in 2016. A majority of Americans (55%) oppose expanding the existing border wall and fencing with Mexico, while four in ten (41%) are in favor. Eight in ten Republicans (80%) favor such a wall, while 85 percent of Democrats and 57 percent of Independents are opposed. Support for expanding the border wall and fencing with Mexico has declined seven percentage points since the summer of 2016, with declining support concentrated among Democrats. Partisan divisions over the importance of controlling and reducing illegal immigration are at all-time highs, with a 52-percentage-point gap between Republicans who see it as a very important goal and Democrats who do not. 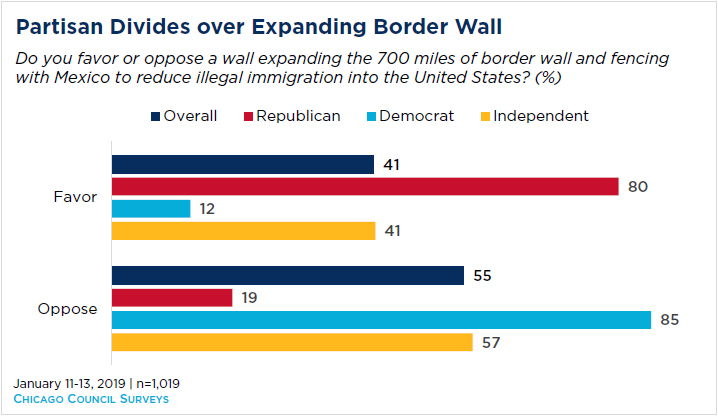 A majority of Americans (55%) oppose expanding the existing 700 miles of border wall and fencing with Mexico to reduce illegal immigration into the United States, while four in ten (41%) favor it. Support for such an expanded wall is strong among Republicans, with eight in ten (80%) in favor. 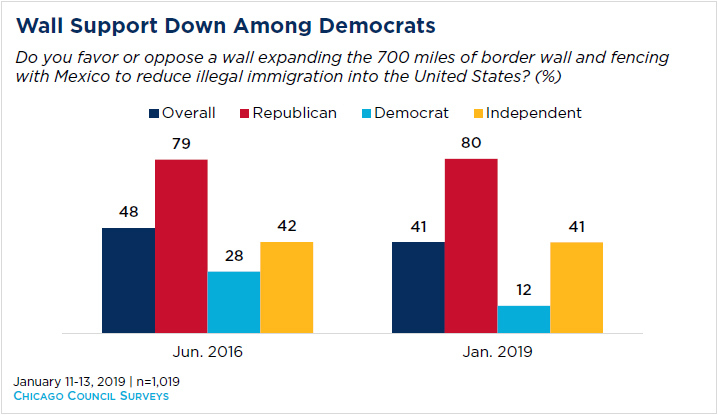 Equally strong among Democrats is opposition to such a wall: 85 percent say they oppose expanding the US-Mexico border wall, as do a majority of Independents (57%). Support for an expanded border wall along the US-Mexico border has declined somewhat since the summer of 2016, when it was a key campaign pledge of then-candidate Trump. That summer, the 2016 Chicago Council Survey found Americans were divided over expanding the wall, with 48 percent in favor and 50 percent opposed. Since then, overall support for a wall has declined seven points, driven by a sixteen-point decline in Democratic support for such a wall. This majority level of opposition to a border wall, and the deep partisan divisions over the issue, are also reflected in several other polls. But survey results are more mixed on the current government shutdown and whether Americans support a compromise. A January 9-13 Quinnipiac poll finds that a majority of Americans (63%) oppose shutting down the government to make sure that the wall along the border with Mexico receives funding. A similar majority (61%) support opening the parts of the government that have nothing to do with border security while continuing to negotiate funding for the wall. But there are wide partisan differences in these views. Nearly all Democrats (95%) and 68 percent of Independents oppose shutting down the government, and solid majorities of Democrats (86%) and Independents (65%) favor opening parts of the government while funding is still in negotiation. By contrast, a majority of Republicans (67%) support the government shutdown, and only 39 percent of Republicans support opening the parts of the government while continuing to negotiate wall funding. Other polls show mixed support for compromise. A January 9-14 Pew Research Center survey reports that a majority of Americans (51%) oppose both expanding the wall and ending the shutdown if it means Trump would get his border wall funding; only six percent of wall opponents would support such a compromise. But a January 8-11 Washington Post/ABC News poll finds that both wall supporters and opponents are divided on whether to refuse wall funding and continue the shutdown or compromise on the wall to end the shutdown. 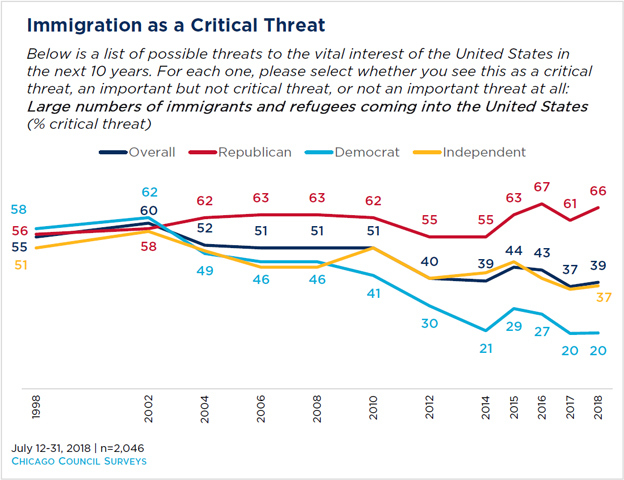 Despite the policy focus on immigration issues over the past two years, the overall American public does not see immigration as a particularly critical threat facing the United States. While in the late 1990s and early 2000s a majority of Americans did see the possibility of large numbers of immigrants and refugees coming into the United States as a critical threat, concern declined in the 2010s. Today, only 39 percent of Americans name the issue a critical threat. At the same time, controlling and reducing illegal immigration is still considered a low foreign policy priority. Only 42 percent of Americans describe it a very important goal, an all-time low since the question was first asked in 1994. These declines in overall American concern have not been consistent across parties, as Republicans remain focused on immigration. Two-thirds of Republicans (66%) say large numbers of immigrants and refugees coming into the United States is a critical threat, while only two in ten Democrats (20%) and one-third of Independents (37%) say the same. 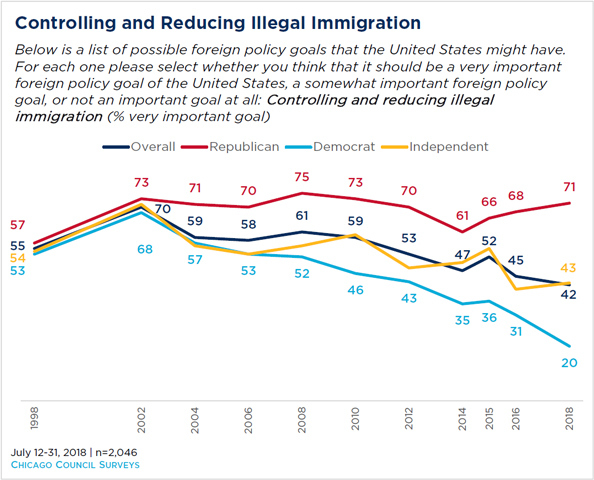 Similarly, seven in ten Republicans (71%) say controlling and reducing illegal immigration is a very important goal, while only two in ten Democrats (20%) and four in ten Independents (43%) agree. This is the largest partisan difference—52 percentage points—on any US foreign policy goal in the 2018 Chicago Council Survey. Views of immigration as a threat have declined over the past two decades, that decline has been concentrated among Democrats, opening up a large gap between the parties. Republicans remain as concerned about the threat of immigration as they were in the early 2000’s. They are also just as likely to say that controlling and reducing illegal immigration is a very important US policy goal during that same time frame. In sharp contrast, Democrats are now at all-time lows on both items. The analysis in this report is based on data from interviews conducted January 11-13, 2019 by Ipsos Public Affairs using their large-scale, nationwide online probability panel, the KnowledgePanel OmniWeb. A total of 1,019 interviews were completed among a weighted national sample of adults 18 years of age or older, living in all 50 states and the District of Columbia. The margin of error on weighted data is ±3 percentage points for the full sample. Additional results come from the 2018 Chicago Council Survey of the American public on foreign policy, a project of the Lester Crown Center on US Foreign Policy. The 2018 Chicago Council Survey was conducted by GfK Custom Research using their large-scale, nationwide online research panel July 12-31, 2018 among a weighted national sample of 2,046 adults, 18 years of age or older, living in all 50 US states and the District of Columbia. The margin of sampling error for the full sample is ±2.37, including a design effect of 1.1954. The 2018 Chicago Council Survey was made possible by the generous support of the Crown family, the John D. and Catherine T. MacArthur Foundation, the US-Japan Foundation, the Korea Foundation, and the Robert R. McCormick Foundation. A January 8-11 Washington Post/ABC News poll finds 54 percent of Americans oppose building a wall along the US border with Mexico (42% support). Support, up from 34 percent in January 2018, is concentrated among Republicans (87%). Similarly, a January 9-14 Pew Research Center survey finds 58 percent of Americans opposed to substantially expanding the wall along the US-Mexico border (40% support), with similar partisan divisions. Half of those opposing the wall say Democrats should keep refusing wall funding even if it extends the shutdown (27% overall), while the other half (27% overall) would support compromising on the wall to end the shutdown. Similarly, while a majority of wall supporters say Trump should continue to demand funding for it even if it extends the shutdown (24% overall), 18 percent of Americans support a wall but would support compromising to end the shutdown.